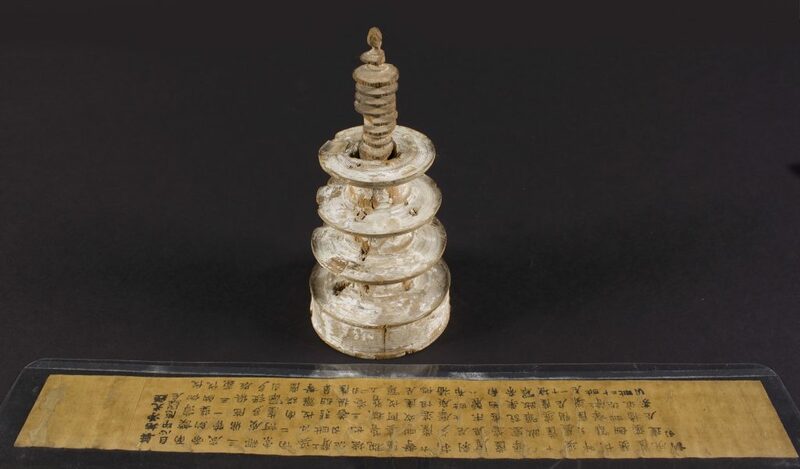 In 1968, McGill acquired a copy of the Hyakumanto Dhāraṇī (百萬塔陀羅尼經), one of the earliest surviving examples of printed text, along with the miniature wooden pagoda within which it was stored more than a thousand years ago. A dhāraṇī can be described as a charm used in Esoteric Buddhist rituals. It was believed that by chanting and copying a dhāraṇī, an individual or a state would be protected from harm. The Hyakumanto Dhāraṇī was commissioned by the Empress Shotoku of Japan during the eighth century to appease the Buddhist clergy and honour the souls lost in a recent revolt. According to historical sources, one million copies of this dhāraṇī were made and distributed across Japan around 770 CE. 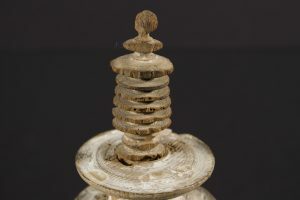 Each of the Hyakumanto Dhāraṇīs was housed in a miniature wooden pagoda, a tiered tower with multiple eaves, such as those commonly seen in the Asian architectural tradition. The most important religious function of pagodas is to store the relics of Buddha and receive worship. The body of this pagoda is made of hinoki wood, a species of cypress,and painted with white lead. The top, or spire, is made from cherry wood. The dhāraṇī text is printed in twenty-three columns of five Chinese characters on a small paper scroll about six centimeters across and forty-six centimeters long. Based on the reported number of copies made and the visible features of the printed characters, there remains debate about whether wooden blocks were used or if – more surprisingly for that time – metal may have been used to print the characters. In either case, this scale of production was not seen again for centuries. The practice of printing dhāraṇīs and housing them in this way was widespread across Northeast Asia from the eighth through the twelfth century. When McGill acquired its copy in the 60s, the Hyakumanto Dhāraṇī was believed to be the earliest surviving printed text in the world. However, similar examples have since been discovered in South Korea and some scholars have dated them to a few decades earlier, though still in the eighth century. Some one hundred miniature pagodas containing dhāraṇī scrolls have also been discovered in Inner Mongolia, China, dating from the early eleventh century. The scroll and its pagoda are, as direct material links from such a distant past, truly remarkable artifacts. There are an estimated 1,700 surviving copies of the Hyakumanto Dhāraṇī located in personal and public collections, most of which are stored in the Hōryū-ji, a Buddhist temple in Nara, Japan. North American Institutions such as the Metropolitan Museum of Art, the Boston Museum of Fine Arts, and the Art Institute of Chicago also hold examples.